Now there's no reason not to have an AVL solution. Mobile Monitor provides a low cost alternative to products costing tens of thousands of dollars, for only a fraction of the price. Web-based mapping interface. No client software or plug-ins required. Uses nearly any map data, including free Tiger/Line maps, and customized maps. Map data in ESRI Shape format. Other formats upon request. Microsoft Certificate Server software installed to the specified Windows operating system; SSL Certificate; A domain name that is assigned to the static IP Address. There are several brands of GPS receivers that can be plugged into the serial port or USB port of a computer. GPS receivers must supply NMEA data via serial port or serial port emulation. GPS Monitor provides the functionality of monitoring a GPS receiver attached to an in-vehicle laptop or tablet and sending coordinate data to the Mobile Monitor server. GPS Monitor runs as a service on Windows NT based computers, and a system tray utility on Windows 9x computers. GPS Monitor is delivered free of charge for Mobile Monitor users that require it. Mobile Monitor detects if the GPS receiver has failed or been unplugged, and reports it on the Mobile Monitor Map screen. The automatic update feature enables mass updating of vehicles without revisiting each computer. Requires Microsoft Windows and a wireless internet connection. Mobile Monitor supports several varieties of GPS modems. GPS modems are modems that use a cellular phone carrier to communicate wirelessly, with an onboard GPS receiver. Generally, the GPS receiver and wireless communication antennas require mounting outside the vehicle. GPS modems can be programmed to send coordinate data to an IP address at regular intervals. Most GPS modems are capable of sending TAIP or NMEA formatted data via TCP or UDP protocol. The AVL Receiver Service runs on either the Mobile Monitor Server, or another server, and converts the data received from GPS modems to a format that Mobile Monitor accepts. AVL Receiver Service is delivered free of charge for customers that require it. Requires Microsoft Windows 5.0 or higher. Map data comes in several formats, the most notable is ESRI Shape format (*.shp). The US Census bureau supplies free map data available for download. Although it is not the most accurate data, for most users on a budget it may be sufficient. Premium map data can be licensed from various vendors such as TeleAtlas, Navteq, and others, which will provide updates at regular intervals. The geocoder and reverse geocoder require shape data from Teleatlas, Navteq, or the US Census bureau. 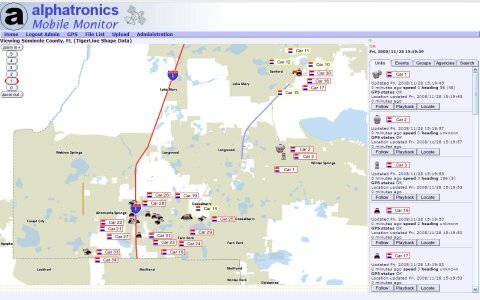 The AVL Web Connector component is an OLE interface that allows posting of events and vehicle position data to the Mobile Monitor server. This allows the user to collect data from a different data source and post it to the Mobile Monitor system. AVL Web Connector provides an interface to the Mobile Monitor geocoder, enabling the user application to convert addresses to coordinates on the fly. Requires Microsoft Windows. Mobile Monitor is extensively documented. Call or email for additional details. Resellers and system integrators welcome.